When you twist the top off to get the goodies inside, a "Thank You" banner comes "pouring out :-). Print the favor tags + mini banner free printables. Cut out the letters into mini banner shapes or your shape of choice. Glue the banner letters to the twine. Attach the end of the twine to the inside top of the bottles with glue or tape. Attach the opposite end of the twine to the bottom inside of the bottle. You may need a pencil to stick in there to press the tape down. Fill your bottle with gumballs . When you pull the top off the thank you banner will come "pouring" out. As you can see you can either do these with the "thank you" inside, outside, or both. I think these are so fun for summer parties or barbecues. What do you think? P.S. If you like my ideas, I'd love for you to subscribe below. I share with my readers exclusive DIYs, and you will get a free party printable set as a little thanks for signing up! 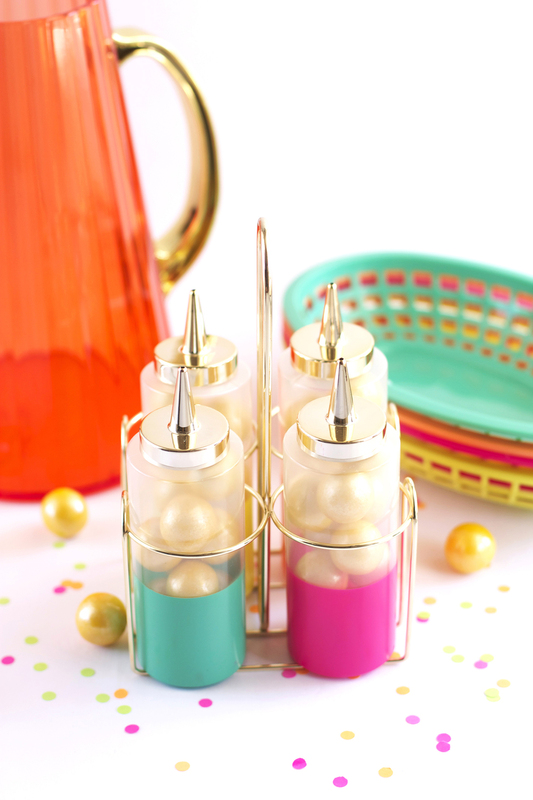 Sign up to receive exclusive DIYs and a free party printable set!